Ketchikan, Alaska - Henry Carlton Strong, who came to Ketchikan in 1899, must have made a lot of money. He involved himself in every developing industry and took advantage of all possible business opportunities. Born in Jamestown, New York in 1869 Strong went first to Port Townsend, Washington and started a hardware business. After 10 years of work, with a stock of hardware, he took off for Wrangell, Alaska in 1898 and came to Ketchikan in 1899. Soon after arriving, he established the Strong and Johnstone Company (with F.C. 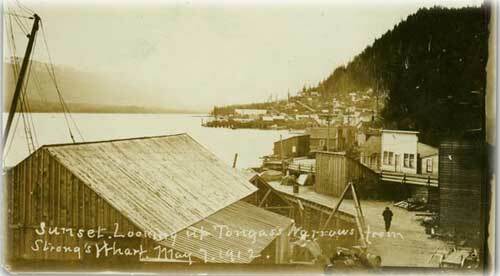 Johnstone and John Stedman), which later became today's Tongass Trading Company. He served as Ketchikan's postmaster from 1899 to 1900, at which time he and F. C. Johnstone bought the Clark and Martin fish-saltery located at the mouth of Ketchikan Creek. Later Strong, Martin and another partner, Carl Sutter, formed a company called Fidalgo Island Packing, bought several acres of land near Ketchikan Creek and built a salmon cannery-the first large cannery ever to be built in Ketchikan. There was money to be made in the fish business! There was money to be made in the mining business too. Along with Mike Martin, Jim Campbell and George "Six-shooter" Grant, Strong established claims at Seal Bay on Gravina Island, the Black Swan near Ketchikan, and at 12-Mile Arm on Prince of Wales. In 1901 with both the fishing AND mining industries expanding, Strong decided a shipping company was necessary to supply the small camps and villages that sprang up around Ketchikan and Prince of Wales Island. He incorporated the Ketchikan Steamship Company and purchased three ships, the Alert, the Alaskan and the Northland. Under Strong's leadership the Ketchikan Steamship Company built a downtown wharf, warehouse, coal shed, and in 1904 extended the wharf to accommodate ocean-going steamships. He then expanded into the ice-cutting business, establishing an operation at what is now called Ice House Cove near George Inlet. He also built a cold-storage plant that became the long-lived Ketchikan Cold Storage Company. In 1903 he became president of Ketchikan's new utility company (and forerunner of Ketchikan Public Utilities), the Citizens' Light, Power & Water Company. Also in 1903 he was elected to the newly-organized Ketchikan City Council. Despite investments in the fishing industry Strong did not give up on mining, but expanded his claims. In 1908 he and C. H. Black and J.C. Barber formed the It Mining Company, mainly to work the It Copper Mine at Kasaan Bay. In partnership with Fred Chapman Strong also established claims at Helm Bay and took out $28,000 in gold. He also helped bond the Riverside Mine on the Salmon River near Hyder and later sold the property for a reported $50,000. He was on his way to becoming a wealthy man. In later years he operated the Northland Steamship Company, Sunny Point Packing Company, and the Home Land Company. The latter company represented Strong's desire, in later years, to give back to the community he'd helped build. With several other Ketchikan business men, Strong bought "the Schoenbar properties, which extend from Mahoney Heights [today's Deermount Street] to Bawden and Pine Streets, skirting the city's edge," according to the Ketchikan Alaska Chronicle in 1925. "The aim of the company is to furnish the man of average means an opportunity to secure a home site at a reasonable cost. It is said the lots will be [surveyed and] offered as cheaply as possible." Henry Strong died in Seattle in 1954 at the age of 85. "Company of Local Business Men Buy Schoenbar Property to Throw It Open for Building of Homes," Ketchikan Alaska Chronicle, Oct. 9, 1925. DeArmond, R.N. Interview by Patricia Roppel, Sitka, AK: 1980. Roppel, Patricia. "Canneries," Southeastern Log, October 1977. Roppel, Patricia. Striking It Rich, Farwest Research Publishing; Wrangell, AK: 2005. Roppel, Patricia. "Where Can I Buy One of These?" Farwest Research Publishing; Wrangell, AK: 1999.